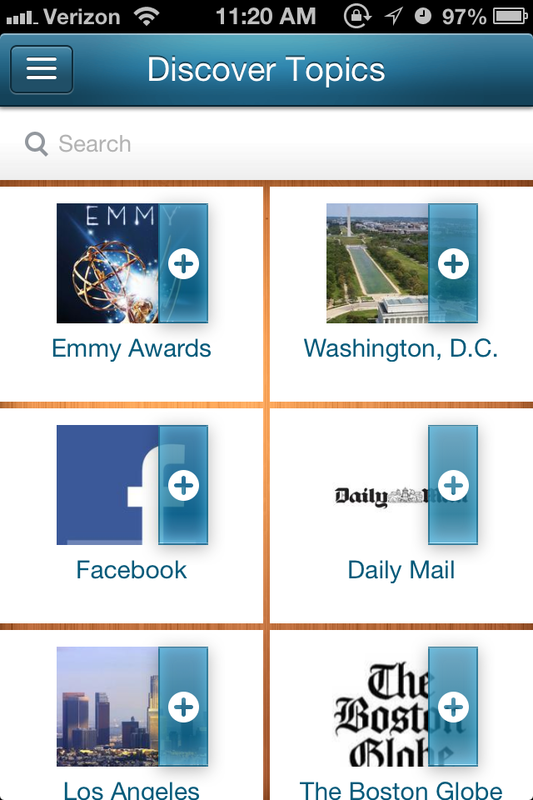 News aggregation apps are nothing new, nothing special – but Wavii wants to change that. First launched out of private beta in April, Wavii (pronounced like wavy) is out with a complete redesign and a new iPhone app, which launched in Apple’s iTunes App Store Thursday morning. Unlike competing apps, Wavii doesn’t just give you the headlines of stories, it uses machine learning to distill the news into a single line, allowing you to skim through stories at 21st century speeds. Wavii’s algorithm crawls the Web in real-time, scraping up news articles, blog posts, tweets, YouTube videos, and other content that its users might find interesting. Using natural language techniques, it then is able to dissect the most important nuggets of information, which it then delivers to users through the app. Not only that, but it sifts through the noise to make sure you’re only seeing one story one time, rather than getting hit with an avalanche of reports about the same news. Sounds pretty impressive, right? Let’s dig in. Download Wavii 2.0 from the iTunes App Store here, then launch the app. After flipping through a few introduction screens, you’re asked to add your Facebook and/or Twitter accounts. Or you can sign up through email. I added both Facebook and Twitter, just to get the full effect. If you already use these social networks on your iPhone, then the sign-up process will happen in less than a second. Wavii then asks you to enter your email address (if you didn’t sign up with email already), where you’ll receive a confirmation email. You then have the option to check if any of your contacts use Wavii; if they don’t you can invite them. Wavii 2.0 delivers content through two basic channels: Your “My Feed,” which include posts and activity from the people you follow as well as “topics” that you choose to add to your feed. (More on those later.) Alternatively, you can browse news in the pre-built categories: Popular, Technology, Entertainment, Politics, Business, and World. Each of these categories are automatically populated with the most-recent, “big” news of the day, as determined by the Wavii algorithm. While Wavii’s schtick is its ability to distill news articles down to their most relevant bits, you can still click on any item to see the full article. Wavii also includes related news or other content, and groups this information together, allowing you to explore a story even deeper. You can also “like” items, comment, or use the six emoticons to convey what you think about a particular piece of content. The more you interact with specific types of news or articles from specific publications, the more Wavii’s computer brain will deliver that kind of content. Unless you have a lot of friends who also use Wavii (I don’t), then topics are your best way to find new content that interests you. To find new topics, tap the menu button at the top-left of the screen, then click “Discover Topics.” Here, you can see a number of pre-loaded topics, most of which are actually just media organizations, like The Boston Globe or NBC. You’ll also find more general topics like “Interviews,” though Aoun says that these kind of very-broad topics are less prevalent than more specific topics. 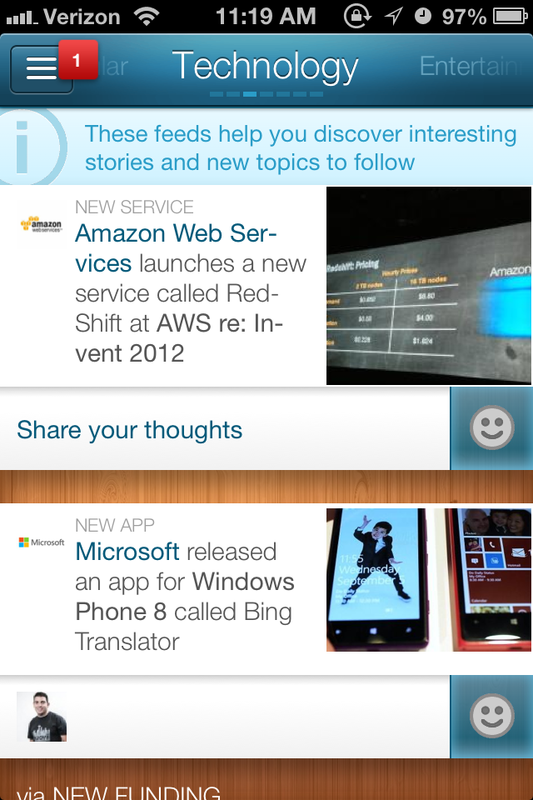 While the topics are a solid addition, I wish the discovery feature were less restrictive. I don’t really want to have to think of stuff to add, search for it, then add it. I’d much rather be given a broad list to choose from, then narrow it down from that starting point. But that’s just me. And I’m kind of lazy when it comes to customizing and curating my apps. I really want to like Wavii, and in some ways I do. The app really does a good job of summarizing news into quickly digestible bits. So if maximum efficiency is the primary thing you look for in a news aggregator, then Wavii should clearly be on your apps short list. 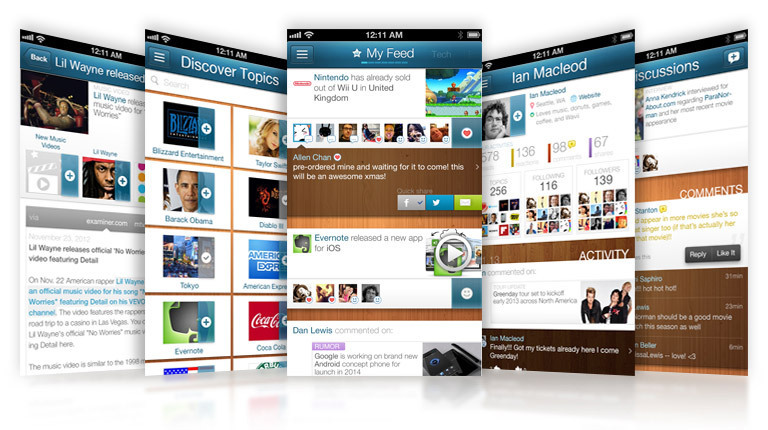 But compared to apps like Flipboard or News360, Wavii’s design is just not quite top-shelf. The text is bolded in odd places. The wood-like background is distracting. And the giant emoticon button draws in my eyes more than the actual news that I want to see. Are these minor qualms? Yes, absolutely. And they may not bother anyone other than me. But with the app market already flooded with news aggregators, Wavii needs to get everything right if it hopes to draw people in.